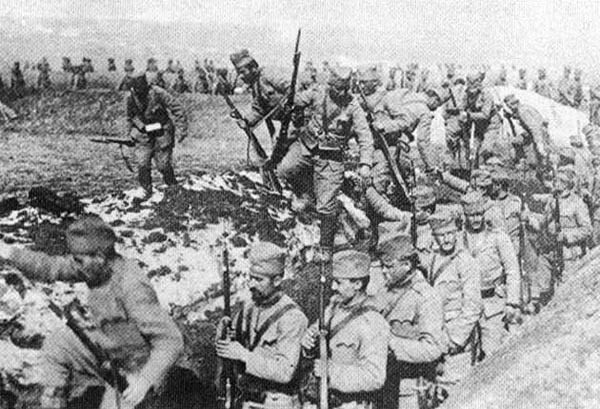 Serbian infantry leave their trenches to attack the enemy. Serbia: Serbs retake Veles (until October 29), forcing Bulgars back on Stip and fight north of Pirot. Troops of German general Gallwitz has advanced 25 miles up the Morava since October 19 although Austrians only up to 30 miles south of Sava–Danube. Allenby GOC British Third Army (Monro send to Gallipoli). Baltic: Cruiser Prinz Adalbert sunk (672 dead, 3 survivors) west of Libau by E8 (Goodhart). Aegean: U35 torpedoes and sinks Salonika-bound British transport Marquette (140 killed out of 646 troops), 3rd and last 1915 loss out of 242 ships conveying 330,000 troops, but one of U35‘s 12 victims (until November) worth 48,813 t.
Turkey: Armenians from Urfa wiped out. Britain: King appeals for more soldiers. Death of WG Grace, cricketer, aged 67.